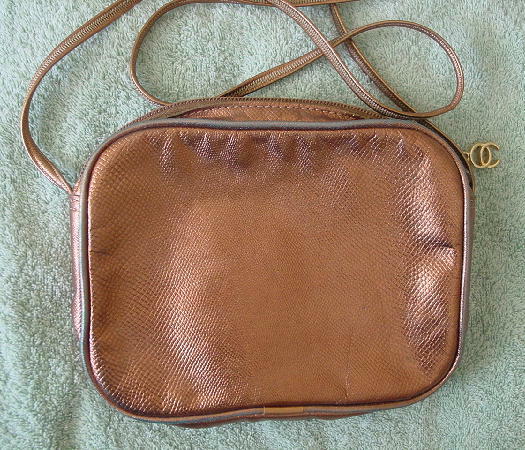 This vintage leather purse has a top side to side zipper with a gold-tone Oleg Cassini logo pull. 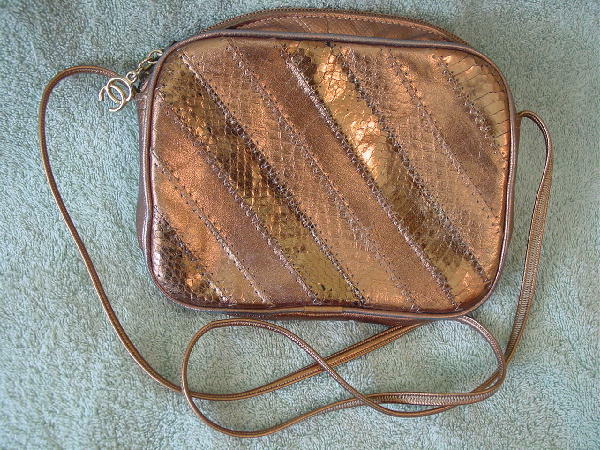 The back is plain and the front has diagonal strips in various colors of embossed snakeskin and plain leather. Some of the scales have a few dark spots. The front is in various shades of copper and gold-tone. The edging on the front and back has a lot of areas where the finish is missing and this gives the edging a greenish-blue color. The interior gray lining has Oleg Cassini and the logo all over it in dark gray-taupe letters. It has a 40" by 1/4" textured shoulder strap. The back has more of a golden-copper color and not so coppery as it appears in the picture. It's from a Los Angeles model/actress.